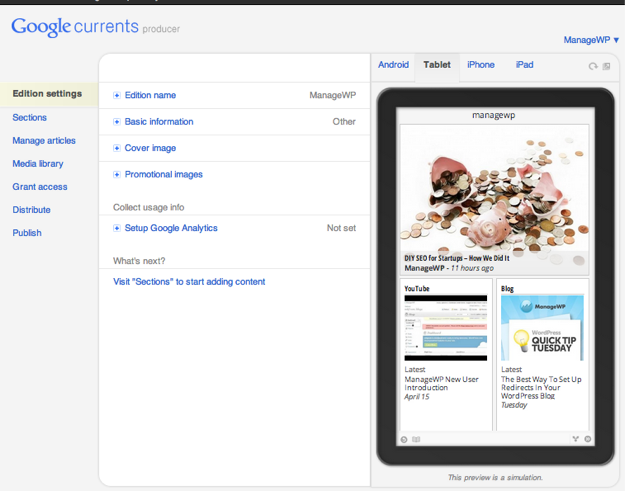 Google Currents – the Future of Content Aggregation? As you can see, Google Currents is essentially an app that pulls various elements of a website’s online presence (be it their RSS feed, YouTube channel, social media outlets, and so on) into a centralized platform for easy access. It is essentially an advanced aggregation service, with built-in features including offline access and language translation. If usage becomes widespread, it could arguably make standalone apps for specific publications largely redundant. Although the app was originally launched in the USA on 8th December 2011, it was only made available internationally on 11th April 2012 – at which point we decided to take a proper look and launch our own ManageWP publication for Google Currents. If you are a blogger, then you will probably want to take note of this new platform. In just four months it attracted nearly 400 “publisher editions” (i.e. major publications that were released in partnership with Google) as well as 14,000 self-produced editions. Having played around with the app for a while, I can tell you that it is a slick and fun way of staying up to date with a good choice of websites. If you are interested in taking a look at the app, just head over to Google Play or the Apple App Store and download it for your mobile device (Android or iOS). 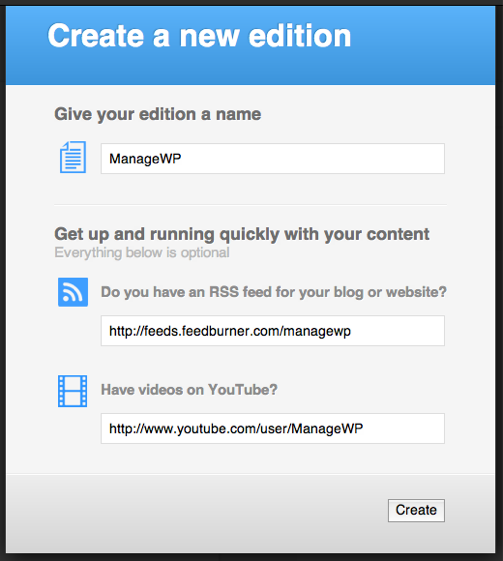 Let’s take a look at how you can set up your very own Google Currents publication. The setup process is extremely simple and can be completed within a matter of minutes. First of all, head over to the Google Currents Producer Page. Rather cleverly (or sinisterly, depending on how you feel about Google), you are only able to access this page with a Chrome browser and valid Google account. As you can see from the screenshot above, you have a great deal of control over (a) what is displayed, and (b) how it is displayed. There are only a few key pieces of information that you should change before going live with your publication. We started off by specifying a category and adding a short description within “Basic information”. 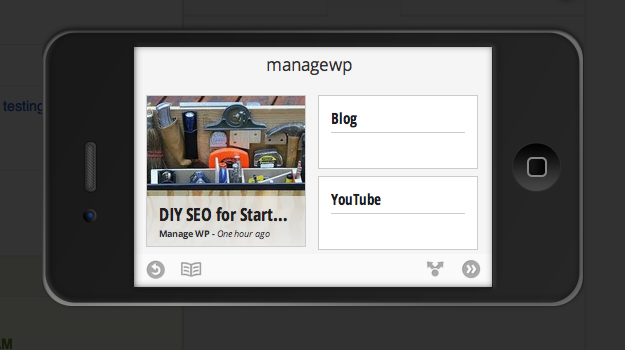 We also added a cover image (a square thumbnail between 64px and 128px). The last thing we did on the “Edition settings” screen is add our Google Analytics ID – so that we can track subscriber numbers. Facebook and Twitter are conspicuous by their absence, but I can’t say I am surprised by Google’s decision not to include them. Once you have finished setting up the different content streams you want to include in your publication, the last step you need to take is to verify your ownership of the content via the “Distribute” screen. This is easily achieved via your Google Analytics account – all it takes is a couple of clicks if you already have one. Once you have verified ownership, you can go live. Until you do so via the “Publish” screen, your shiny new publication will only be accessible by account administrators. Once published, you will be provided with a link that you can share (here’s ours). You will of course need to (a) have the Google Currents app installed and (b) access the URL from your mobile device in order to subscribe. 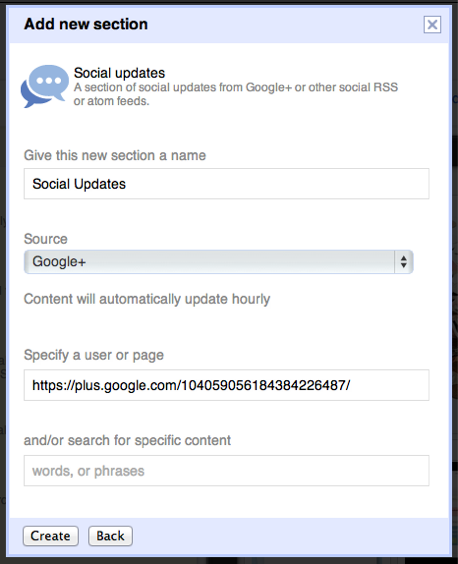 It literally only takes a few minutes to set up a Google Currents account, and it really is a “set and forget” affair – the app will automatically update your publication as you create new content across the various mediums. But is it going to benefit your site? Just like RSS, it is another means of reading your content without actually visiting your website – thus potentially negating your signup forms and/or sales funnels. On the flip side, Google Currents is a potential source of traffic that you might not otherwise reach – once you have 200 subscribers, people will be able to find your publication via the Google Currents search engine. But to get to those 200 subscribers, you are going to need to promote the publication heavily via your blog and social media outlets. At the end of the day, Google Currents is a more versatile form of content aggregation than RSS, and it has obvious benefits for the end user in terms of ease of access to your content, but its potential in driving more traffic to your site is open for debate. We’d love to get your thoughts in the comments section, so please don’t be shy – what is your take on Google Currents? Thanks for your comment Prav!